Located approximately 50km from the Villa Coreglia Antelminelli is a delightful medieval hamlet in the Serchio Valley, the north-eastern part of the province of Lucca. Suspended in time at 595m between the Apuan Alps and the Tuscan and Emilian Apennines, Coreglia Antelminelli was home to the first chalk sculptors, and in recognition of this tradition the town has a special museum dedicated to Chalk sculptures, where chalk figures from the 18th & 19th Century are on display. The position between woodland and vineyards, the Roman remains, the fortifications and the impressive backdrop of the Apuan Alps make this a pleasant town to visit. Worth a visit in Coreglia Antelminelli is: The remains of the ancient Citadel, complete with winding tunnels; The Church of San Martino, one of the oldest churches in the Lucca area, where one can admire valuable works such as the Madonna del Rosario painted by Pietro Sorri in 1598; the Church of S. Michele, built in 1000 right next to the fortress and tower and later transformed into the bell tower; Palazzo Vincenti, birthplace of Benedetto Puccinelli, one of the leading Italian botanic experts of the 19th Century; and the Church of Santa Maria Assunta in nearby Tereglio. 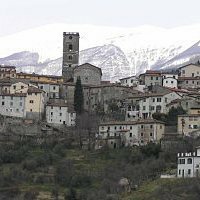 Furthermore, not far from Coreglia Antelminelli you can find the fortified town of Ghivizzano, a small village that allows you to step back in time.